Jeff’s practice focuses on general civil litigation, business litigation, and civil appeals. Jeff has handled a variety of matters, including contract disputes, partnership disputes, trust litigation, trademark infringement cases, bankruptcy adversary proceedings, employment disputes, franchise arbitration, fraud and attorney malpractice cases. He also advises his clients on investigations and transactional matters. Represented a Silicon Valley real estate investment and management company in multiple disputes with investors. Represented a bankruptcy trustee of a gold mining company as special litigation counsel. Represented a national financial institution in successfully asserting multiple malpractice claims against its former counsel. Represented an aerospace manufacturing company through trial and post-trial proceedings in an ownership and breach of contract dispute. Represented a franchisor in a breach of contract and franchise termination arbitration. Represented trust beneficiaries against a trustee who stole the assets of a large family estate. Handled multiple civil appeals from initial review through briefing and oral argument. 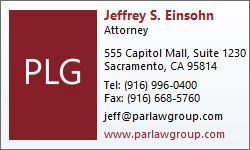 Jeff is admitted to practice in all California and Nevada State Courts, the Ninth Circuit Court of Appeals, the U.S. District Court for the Eastern and Northern Districts of California, and the U.S. District Court for the District of Nevada. Jeff earned his Juris Doctor from the University of San Francisco School of Law in 2008 with a certificate in intellectual property law. Prior to attending law school, he graduated from the University of California, Santa Cruz with a bachelor’s Degree in Neuroscience and Behavior.